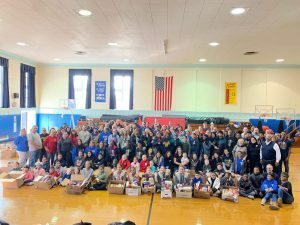 Clara H. Carlson School Principal Stacia Walfall (left) and Assistant Principal Richard Mansfield (back row, center) are pictured with teachers, staff and student-volunteers, who lent a hand sorting and packing food donations. 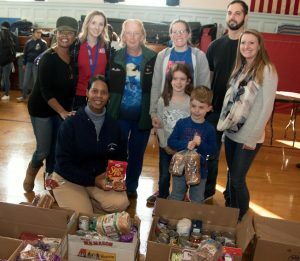 Elmont School District Board of Education trustee Karen Taylor-Bass (back row, left) is pictured with volunteers from Alden Terrace School, including Principal Shawnée Warfield (front, left). 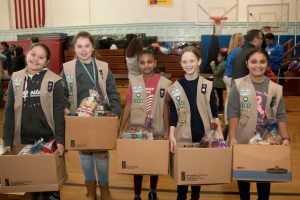 Girls Scouts from Troop #1335 carried boxes of food to the school buses for delivery. 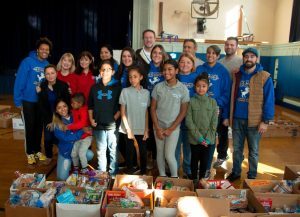 Gotham Avenue School Principal Marshall Zucker (back row, third right) and Assistant Principals William Mingo (back row, second right) and Pamela Stamidis (fourth, left) joined teachers and staff to lend a helping hand. 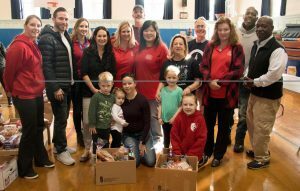 More than 100 volunteers helped out the Elmont Dad’s Club at its annual Thanksgiving Food Drive.